Laplace Expansion: An algorithm for calculating the determinant of a square matrix. Laplace expansion is an algorithm for finding the determinant of a matrix. Laplace expansion is also called expansion by minors and expansion by cofactors. The Laplace expansion is named after French mathematician Pierre-Simon Laplace (1749-1827). Add or subtract each element multiplied by the its cofactor. where aij is an element of the matrix and Cij is the cofactor of element aij. The minor of an element of a matrix is the square matrix formed out of the matrix by excluding the row and column of the element. See figure 1. 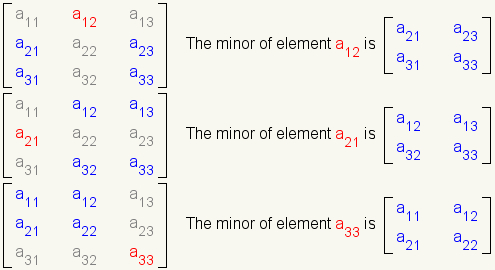 The cofactor of an element of a matrixis the determinant of the minor of that element. Whether an element and its cofactor are added to or subtracted from the result depends on the position of the element in the matrix. Figures 2, 3, and 4 show whether a particular element is added or subtracted. Figure 1: Minors of a 3×3 matrix. Figure 2: Signs of cofactors for a 2×2 matrix. Figure 3: Signs of cofactors for a 3×3 matrix. Figure 4: Signs of cofactors for a 4×4 matrix. 1 Find the determinant of 3x3 matrix A by cofactor expansion. 2 Select a row or column to expand. Since element a22 is zero, it makes calculations easier. Row 2 is selected. 3 Start with element a21. Find the cofactor of a21. 4 Calculate the value of the cofactor of a21. 5 Since a22 is zero, it is not necessary to calculate the value of the cofactor of a22 since 0·x = 0. 6 Now find the cofactor of element a23. 7 Calculate the value of the cofactor of a23. 8 Use the cofactor equation to find the determinant. McAdams, David E.. Matrix . allmathwords.org. All Math Words Encyclopedia. Life is a Story Problem, LLC.. 8/31/2018. http://www.allmathwords.org/en/m/matrix.html. McAdams, David E. Laplace Expansion . 12/21/2018. All Math Words Encyclopedia. Life is a Story Problem LLC. http://www.allmathwords.org/en/l/laplaceexpansion.html.